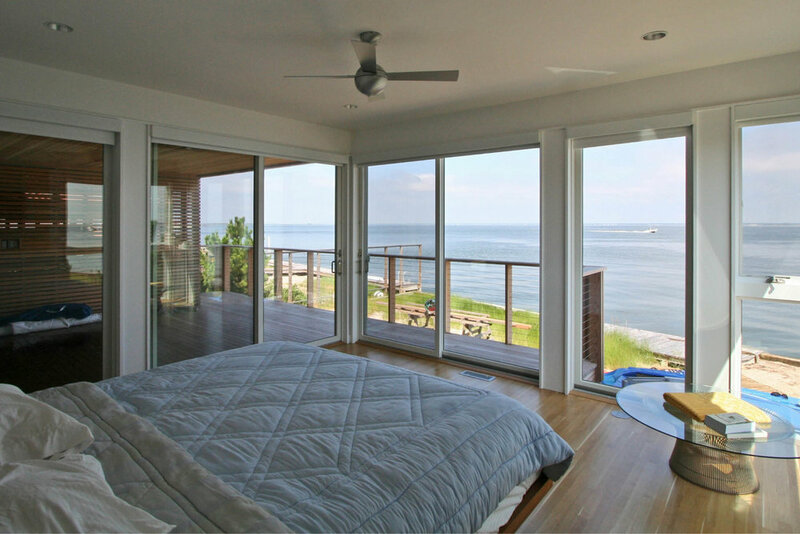 Located on Fire Island, a barrier island off of Long Island, NY, this bay-front house is the summer retreat for a family who lives and works in Manhattan. The house is designed as two distinct volumes, to provide the parents and their adult children with separate quarters for living and entertaining. The volumes are clad in cedar and connected by a glass bridge, sheltering a courtyard and pool, which receive western exposure for maximum daylight. The design of the house prioritizes views and access to the outdoors. The typical configuration of private spaces stacked on top of a lower public zone is flipped; in this residence, the communal upper level enjoys the best views and access to outdoor decks for entertaining. Kitchen, dining, and living space flows out to the bay beyond, ideal for watching summer sunsets. Large expanses of glass, in the form of continuous sliding doors break down the boundary between interior and exterior, and add to the airy, openness of the house. The house embraces local island traditions, through both its construction process and its design. Cars are prohibited on the small island, so the house and its material were brought on barges to the site. The primary mode of transportation on the island is wagons and bikes. The design of the large curving entry ramp accommodates for this mode of transportation, allowing wagons to be wheeled right up to the front door. Plenty of parking for bikes is also provided. Natural ground cover of beach grasses and brush keep the site low maintenance and sensitive to local vegetation. 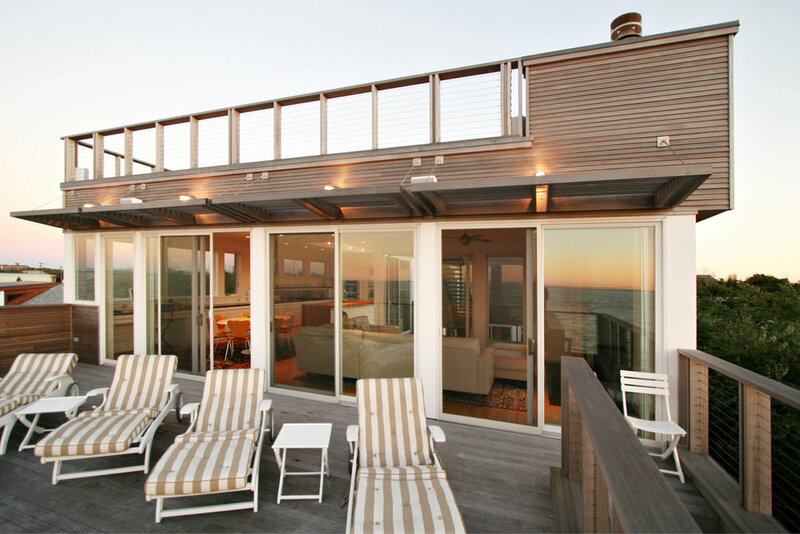 The cedar siding ages to a silvery grey, and adapts this modern volume to the beachfront vernacular.